I missed the first episode of From Dusk Till Dawn: The Series when it aired but caught the second one. Since I have seen the movie and there was a lot of exposition I quickly caught up to what was going on. Spoilers for the movie and show ahead. The episode began with a Tarantino-esque scene of Seth and Richie Gecko having a conversation over a meal. While not up to the level of the diner scene in Reservoir Dogs it's a decent attempt. In between talking about mole sauce, pico de gallo and horchata they managed to bring me up to speed on the characters. D.J. 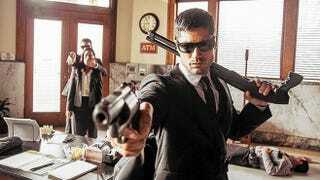 Cotrona is doing a passable Clooney-lite as Seth. Zane Holtz's version of Richie is different than Tarantino's however. This Richie is more than just an unstable guy with woman issues. He seems to already have some connection to Santanico Pandemonium that I assume will be explored a bit more in later episodes. It's clear that the show isn't just the movie stretched to a ten episode series. Wilmer Valderrama's character is more than a drug lord and an incident with the ex-preacher Fuller suggests that the Geckos running into the Fullers and their RV might not be random chance. Is it great television? It's not Hannibal but it's watchable. Will I watch the next episode? Absolutely. While it looks like they're going to hit the major beats of the movie there's a lot more going on. This is Robert Rodriquez's version of the story (he directed the movie but Tarantino wrote it) and I want to see where he goes.